Hello everyone, Rebecca here, the social skills coordinator at camp. Our social skills program is called Pow Wow. It is an integral part of our social skills curriculum at Northwood and helps to facilitate the social dialogue that is embedded within our program. Each week the Pow Wow program has a theme that targets different social skills. Cabins participate in Pow Wow once a week and receive related activities to complete in their cabin. Today, I had two wonderful Pow Wow sessions with the gentlemen from Cedar 1 and the ladies of Deer 1 and 2. We have just begun our second week of Pow Wow and each cabin has had at least one session. Last week, we began the Pow Wow season with an introductory session centered around the quote “Be together, not the same” (yes, this was inspired by an Android commercial). Our first week introduced the social skills program and focused on the development of the 2016 Northwood community. Beneath the umbrella of our theme, groups focused on different targeted skills. Some groups, practiced introductions where they practiced shaking hands and introducing themselves to members of the camp community. Other groups, identified conversation starters and topics for meeting new campers and counselors, as well as conversation starters to catch up with friends from past summers. All groups learned about the Northwood Super Hero Program and began the process to select their “Super Power” for the summer. The Super Hero Program began five years ago and it is a program that we use to positively reinforce examples of campers using their strengths to enhance the Northwood community. Each camper and counselor selects a personality trait that they identify as one of their greatest strengths. Throughout the summer, campers are recognized for their Super Powers and become “Super Heroes, marked by a bright green bracelet, when their counselors catch them using their strengths. This week, we began our second week of Pow Wow. 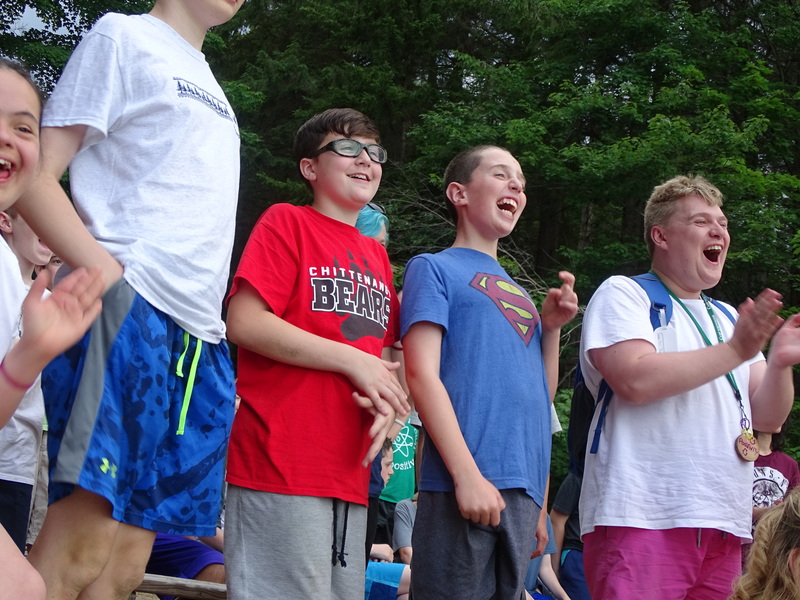 Campers returned to Pow Wow and shared the Super Powers that they came up with in conversation with their counselor team over the course of the week. The introductory session activity this week reinforces our theme of community and the way that each camper has unique qualities that add to the Northwood and cabin community. On popsicle sticks campers wrote their super power, their cabin, and their name. Cabins were instructed to throw the individual popsicle sticks as far as they can. The activity was then repeated with all of the popsicle sticks joined together with a rubber band. The campers from Cedar 1, this afternoon, made very insightful connections debriefing the activity about teamwork and the benefit of operating as a cabin unit. In addition to building community, the social skills focus for the week is on “trading information” and conversations. Campers are discussing, role-playing, and debriefing conversations where information is shared equally between two people. We are focusing on finding common interests, sharing air time, and initiating conversations. Over the course of the week, counselors will be following up on the session with related games and activities in the cabin designed to promote identifying common interests and facilitating conversation. Next week, we will review trading information and moving into skills focusing on reading and interpreting nonverbal body language.